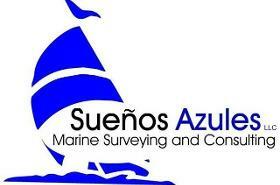 Suenos Azules Marine Surveying and Consulting offers complete marine surveying of sail and power vessels, appraisals, and consultation. This company is dedicated to the highest standards in the boating industry. The South Florida area is my home territory, however I conduct surveys throughout the United States, the Caribbean, Belize, and Costa Rica. Travel to other places can also be arranged. A variety of report formats are available. • Pre-purchase, appraisal, insurance, damage, ultrasonic, consultation. • Sail or power yachts. • Report guaranteed within 3-5 business days after the survey (some exceptions may apply). • We work weekends and most holidays. One of my goals with new clients is to make arranging the marine survey as simple and painless as possible. Therefore I have set up a very simple and easy system of arranging everything needed to review my qualifications, see samples of my previous work, download the necessary agreement form, make payment, and set up the time and date for the survey. This can all be done via my website right from your computer or mobile device no matter where you are in the world. I understand that in some cases that your time may be short and your need for a marine surveyor can be immediate to meet your deadline. As a boat owner I understand the blind trust you are placing in a surveyor you are deciding to hire with the hope that you will get a complete, thorough, and accurate survey so you know exactly what you are facing with a boat or yacht. Because I know all to well what if feels like to be the client needing a survey, I have included all I can on this website so you can feel as comfortable as possible with hiring me as your surveyor. 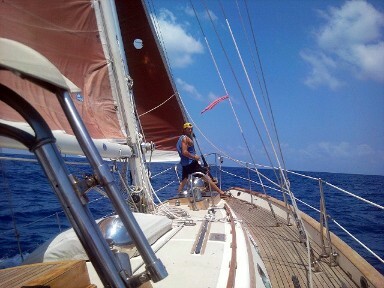 I survey every boat or yacht as if I were the client. I have built this company from an idea stemming from my background and a passion for boating. I take my time on every survey. I give each client 100% on every survey inspection and report. A marine surveyor's goal is to find problems before they cost you money or worse! A qualified surveyor knows where to look for trouble. Do not buy without an independent expert survey and appraisal. A thorough survey of a new or used boat puts the prospective buyer in the advantageous position of being able to bargain either price or for repair work to be done before purchase. This often amounts to thousands of dollars saved and typically more than offsets the cost of the survey. Not to mention that the information contained within the survey is invaluable to a new owner. I do not work for brokers or sellers. As a marine surveyor I will only provide you with a non-biased report of findings on a vessel that will satisfy any underwriter or lender because I am a member and prescribe to the ethics and standards of SAMS® -Society of Accredited Marine Surveyors, USPAP® -Universal Standards of Professional Appraisal Practice, and ABYC® -American Boat and Yacht Council. Furthermore, as a graduate of the Chapman School of Seamanship, I conduct all of my marine surveys thoroughly to the standards set forth by their program. Earned various manufacturer technician certifications and certificates in 2017 and 2018 with Yamaha, Mercury / MerCruiser, Evinrude, and Honda. This included outboard engine certifications with Honda Marine (level one and level two outboard engine certifications), advanced training in Mercury Verado outboard engines, and advanced training in Evinrude G2 outboard engines. I attended Yamaha University in Kennesaw, Georgia for a total of three weeks between September, 2017 and August, 2018. I earned my Yamaha Electrical Systems Certification, Yamaha YDIS (Yamaha Diagnostic Information System), and the XTO Offshore Outboard Engine Certification. Earned various manufacturer technician certifications and certificates in 2015 and 2016 with Yamaha, Mercury / MerCruiser, and Evinrude. Earned technician numbers with Yamaha, Mercury / MerCruiser, and Evinrude. Attended Yamaha University in Kennesaw, Georgia for a total of three weeks between September - October, 2016. I earned my Yamaha Service and Maintenance engine certificate and two engine certifications in V-Engine Systems and Inline Engine Systems. I Graduated from McFatter Technical College in August, 2016 (Marine Service Technologies). This program included applied studies and hands on training with gasoline inboard and outboard engines, diesel inboard engines, drive train training, troubleshooting and diagnostics, and advanced electrical training on marine engine and electronic systems. I was awarded the "Honors" designation for achieving an academic grade point average over 3.5. I graduated with a cumulative GPA of 3.83. Attended the SAMS® 2014 International Meeting and Educational Conference in New Orleans, Louisiana which included presentations on: Ethics, Case Histories, High Capcity Batteries, Vessel Stability, Trip and Tow Basics, Marine Litigation, Four Stroke Engine Failure, Disclaimers, Reports, and Work Orders. The Key Note Speaker was U.S. Coast Guard Captain Wayne R. Arguin, COTP New Orleans. Attended and passed the ITC® 2014 32 hour Level II thermographer certification training course in Tampa, Florida. This course included reinforced training of the level one certification concepts, training on predictive maintenance thermography, refine image analysis and interpretation proficency with in depth survey and measurement techniques, and laboratory training for fine tuning thermal analysis skills. A passing score on a written examination and an accepted field assignment was achieved prior to certification. Attended the IAMI® (International Association of Marine Investigators) 2013 23rd Annual Training Seminar in Isle of Palms, South Carolina. This four day training seminar covered training and presentations on: Hull identification numbers and requirements on U.S. and foreign vessels, a review of navigation rules, cell phone technologies for investigators, FBI evidence response teams, titiling requirements, admirality law, cargo theft, electricity and boat fire investigations, international marine restoration, causes of fires on boats, boating accident investigations, and Federal carriage requirements. Special guest speakers that attended were Alvin A. Taylor, Director of the South Carolina Department of Natural Resources and Captain Micheal F. White Jr., Commanding Officer, U.S. Coast Guard Sector Charleston. Attended the ITC® 2012 32 hour infrared training seminar in Tampa, Florida. This course included training in the manual adjustment of infrared cameras, determining proper emissivity, theories of thermography, and case studies and analysis of thermographic imaging. Attended the SAMS® 2011 Gulf Region Meeting which included the USPAP® Presentation. Other presentations were: Joint Field Surveys, Valuing Pleasure Craft, Marine Asset Appraisal, and Non-Destructive Testing in Marine Surveying. Attended the SAMS® 2010 Annual Meeting and Educational Symposia in Fort Lauderdale, Florida which included presentations on: Inspecting Vessels to CE Standards, Cargo Theft, NMEA® Systems and Testing, Expert Witness Testimony, Personal Injury Claims (the Jones Act), Propulsion Systems in Recreational Vessels, Stability and New Coast Guard Regulations, Inspecting Refrigerated Cargo, Inspecting Sailboat Rigging, and Fire Investigations. Special Guest Speakers were Rear Admiral William D. Baumgartner of the USCG 7th District Command, Judge Maria E. Dennis of the 11th Judicial Circuit Court in Miami, Florida, and John Adey, Technical Vice President of ABYC®. Contributing one’s skill and knowledge to further the profession’s commitment to serving the public. The surveyor will participate in continuing education as required by the rules of the Society. Advertise only in a dignified manner, being careful to avoid misleading statements.